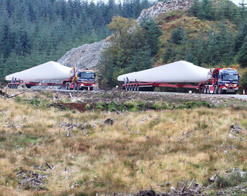 The Carraig Gheal Wind Farm is developed by Alloa-based GreenPower. The project is 50% owned by GreenPower and 50% by the Ampere Equity Fund. GreenPower is a successful independent renewable energy developer. We develop wind and hydro power projects, from single turbines providing local power to multi-megawatt grid connected wind farms. The company was formed in 2000 and has a portfolio of projects in development. These projects range from the small scale (< 1 MW) to utility scale. Our current focus is on the development of wind, hydro and solar projects. Ampere Equity Fund invests in onshore wind, solar PV and offshore wind projects in The Netherlands, Germany, France, Spain, Italy and the UK. The Fund has built a diversified portfolio of renewable energy assets and has attracted five major Dutch institutional investors with a total committed capital of EUR 320 million. It utilizes proven technology with the objective of providing stable and predictable long term returns for its investors. This fund is managed by DIF which is a leading independent fund management company, with ca. €2 billion under its management. DIF manages investments in high-quality infrastructure assets, including renewable energy projects and other core infrastructure projects in Europe and North America.